While collecting spiders one day from palmettos along Black Creek Canal just outside of Miami, Florida, I was delighted to discover a small, slender "ant" that had fallen onto my beating sheet. The "ant" I saw that day gave away the fact that it was not really one of the stem-nesting ants common in such situations by its lack of bulging compound eyes and the fact that it had eight legs. It was a spider posing as an ant and, while it resembled a close relative known somewhat euphoniously as Synemosyna formica, it was much lighter in color. It was, in fact, a spider I had wanted to see for some time, a spider that went by the jaw-breaking Latin name of Synemosyna petrunkevitchi. To the untrained eye it looked almost exactly like a small, pale yellow, slender arboreal ant. 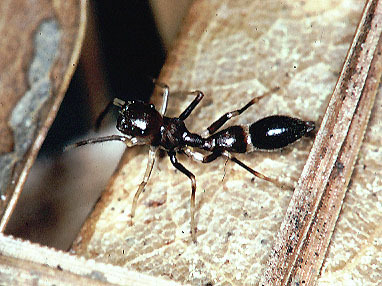 The ant mimic Synemosyna petrunkevitchi from Florida. Resemblance to things that they are not (mimicry) is a common phenomenon within the order Araneae, or spiders; some spiders resemble bird droppings, bark, or sand surfaces. However, I was more interested in those that mimic ants or beetles, and jumping spiders in the genus Synemosyna are unusually good ant mimics. The whole subject of mimicry of other organisms has been controversial, and spider mimicry is no exception. Mimicry between arthropods has been divided into four major categories. The first is classical Batesian mimicry in which the mimic is edible or non-venomous and the model is either distasteful or venomous. The second is Müllerian mimicry, in which both model and mimic are distasteful or venomous. A third is Peckhamian mimicry, or aggressive mimicry, in which the model is the prey of the mimic. Finally, we have Wasmannian mimicry, a more specialized form of mimicry, in which organisms that mimic ants are also inhabitants of the ant nest. Another possibility, so far without a discoverer's name applied to it, would be that spiders resemble ants or beetles in order to get "lost in the crowd" and thus avoid predators. A similar effect is called schooling in fish. Unfortunately, these examples are not as clear-cut as we would like. The examples of one form of mimicry have, with study, often been shown to be really examples of another form. For years the monarch butterfly and its mimic, the viceroy, where thought to be involved in Batesian mimicry. However, more recently analyzed data have indicated that the viceroy is also unpalatable and thus the pair is an example of Müllerian mimicry. The mimicry of ants and beetles by spiders is also, on its face, not easily categorized. It is especially difficult to tell whether the spiders are using aggressive, "schooling" or Batesian mimicry, as spiders could be preying on ants or beetles, or hiding in a crowd, as well as mimicking distasteful models. Also, while few or no salticid (jumping) spiders inhabit ant nests, there are ant mimicking spiders that do so and these thus are Wasmannian mimics. Müllerian mimicry, while less likely, could not be ruled entirely out completely, as the chemistry of the mimics is little known. The beetle mimic Sassacus papenhoei from Missouri, United States. Studies since 1970 have apparently resolved this issue for at least some salticid ant mimics. Experiments conducted by Engelhardt in Germany, Cutler at the University of Kansas and Nelson at Robert Jackson's laboratory in New Zealand have always resulted in Batesian mimicry winning out. The ant mimics do not even like ants for food, but birds and other jumping spiders are often inhibited from attacking them. Apparently they are put off by the possibility of experiencing a painful sting or a mouth full of formic acid. When they are attacked the spiders are eaten with relish, thus they are not Müllerian mimics. Apparently looking like an ant does protect you from certain visually oriented predators. Thus such ant-like jumping spider genera as Peckhamia and Myrmarachne look like ants because looking like an ant has high survival value for them and selection, playing an original slight resemblance, has forced them to look more and more like ants. 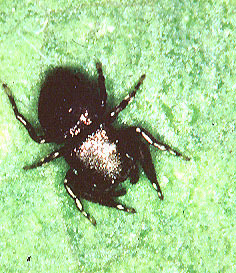 The question is not so easily resolved for the several kinds of spiders that are apparent mimics of flea beetles. The chemical defenses of these beetles are imperfectly known, although at least some produce potent poisons. One species of related beetle is used as a source of one of the most powerful arrow poisons known. Found in the Kalahari Desert of Namibia, the pupae are used as a way to poison arrow or spear points by the local tribes. The poison-tipped darts can bring down a large antelope! Adults of the flea beetles are probably less toxic to predators and they may only impart a bad taste. This allows the mimics to benefit from the avoidance reaction acquired by the would-be predator. Thus at least some flea beetles or their relatives are prime candidates as Batesian models. from the eastern United States. Could aggressive (or Peckhamian) mimicry be an explanation for some beetle-mimicry? So far on this all we have is negative evidence; no beetle mimics have been collected eating the beetles they mimic. Unpublished experiments by Robert Jackson seem to show that at least one beetle mimic is quite edible and so Müllerian mimicry seems unlikely. Also, while one uncommon beetle mimic from the eastern United States has been collected with its model flea beetles, its much commoner relative in the west and south is almost never collected with flea beetles, so schooling (loosing yourself in the crowd) may be out. Batesian mimicry seems to be the most likely explanation for the similarity. In addition to these mimics, at least one North American species of large jumping spider is a quite obvious mimic of females of the larger velvet ants. G. B. Edwards of the Florida State Collection of Arthropods pointed out this fact several years ago. The spiders look much like and act like these wingless wasps when they transverse open spaces. As these wasps have one of the more potent stings of the Hymenoptera, it is little wonder that some organisms have come to resemble them! They appear to be obvious Batesian mimics. The similarity between some jumping spiders and ants, velvet ants or beetles can be startling. While some are apparently generalized primitive (ponerine) ant mimics, Synemosyna (as noted earlier) closely resembles the ant genus Pseudomyrmex, another looks much like a dolichoderine (stingless) ant, and another looks much like arboreal ants in the genus Crematogaster. It is easy even for a specialist to be fooled by Synemosyna. Apparently their predators are easily fooled into treating them as ants, and at least some ants sting or are unpalatable. Some of the ponerines are, in fact, somewhat dangerous, as their stings, at least in some tropical species, can cause temporary paralysis. What seems odd is that there are apparently no jumping spider mimics for the fierce harvesting ants of the western United States. However, this may only be a result of a lack of species with the genetic ability to look like these ants, more than from lack of a niche for such a species. As it turns out, jumping spiders may have simply missed a few chances to take advantage of such opportunities, although the ones they did take advantage of are certainly impressive. As for beetle mimicry, there may have been only a few beetles available as models, jumping spiders have had limited genetic potential for evolving resemblance to many beetles, or there may be some combination of these factors to account for the limited examples. All or most of these seem to have been flea beetles, although I have heard reports of weevil mimics in some parts of the Asiatic tropics. I once thought that most metallic jumping spiders may be generalized beetle mimics, however it was pointed out at several scientific meetings by G. B. Edwards (and repeated to me by Robert Jackson via Simon Pollard) that some might actually be mimics of water droplets! Thus, only those with distinctly pill-like bodies can be really certainly referred to as possible beetle mimics. 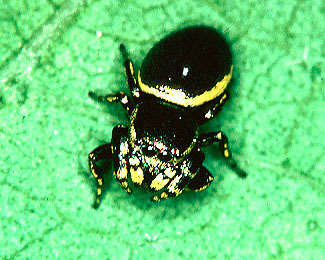 Other metallic jumping spiders, like Salticus peckhamae, Sassacus vitis and numerous tropical species may indeed be water droplet mimics, somewhat like lichen, leaf or detritus mimics that are common among arthropods. The resemblance of some small spiders to other, less edible, arthropods is certainly one of the many wonders of natural selection, but it also points out the contingency of evolution. Some roads were not taken that seem no worse, and in some cases seem better, than those that were followed. Evolution can only work on the material at hand with almost absolute blindness. Apparent direction comes from trends that are almost as unpredictable as a drunkard's walk. Those organisms that succeed do so because they were fortunate to have what it took to survive in those sets of circumstances, not because they were "superior" in any lasting sense. Solving the bases for individual cases of apparent mimicry, which are only touched on so far, could be a very interesting problem for advanced amateurs or graduate students. In addition to the cases already mentioned here, there are many others. For example, one group of tiny apparently beetle-like tropical salticids may actually be mite mimics, or may possibly appear beetle-or mite-like as a result of the convergent evolution of armor as a solution for desiccation problems. Smaller organisms have more difficulties because of the high surface area to volume ratio, which allows more proportional water loss. Microscopic examination of the mimic and model cuticle may also reveal some interesting parallels. Certainly there are a lot of problems out there for any natural historian. I would like to thank William Amos and Robert R. Jackson for reading this manuscript and offering suggestions to improve it. My daughter Becky also suggested several useful editorial changes. Comments to the author David Richman welcomed. The beating sheet is a standard method of collecting arthropods (insects and spiders, primarily) from shrubs and trees. The sheet, which is mounted on a pair of crossed wooden sticks, is held below the branch and a beating implement, usually a net handle, cane pole, or handy stick, is used to beat the branches above it, causing the arthropods to drop onto the sheet. Cushing, Paula E. 1997. Myrmecomorphy and myrmecophily in spiders: A review. Florida Entomologist: 165-193. Cutler, Bruce. 1991. Reduced predation on the antlike jumping spider Synageles occidentalis (Araneae: Salticidae). Journal of Insect Behavior 4:401-407. Edwards, G. B. 1984. 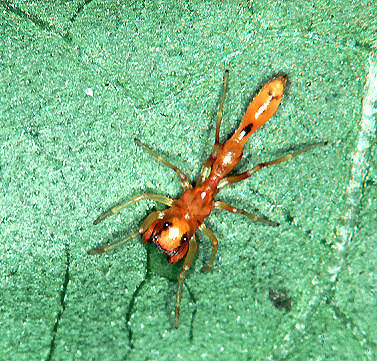 Mimicry of velvet ants (Hymenoptera: Mutillidae) by jumping spiders (Araneae: Salticidae). Peckhamia 2: 46-49. Engelhardt, W. 1970. Gestalt und Lebensweise der "Ameisenspinne" Synageles venator (Lucas). Zugleich ein Beitrag zur Ameisenmimikryforschung. Zoologische Anzuge 185: 317-334. Nelson, Xenia J. 1998. Morphological and behavioral adaptations of two species of ant-like salticids (Myrmarachne). M. S. Thesis, University of Canterbury, Christchurch, New Zealand. Pasteels, J. M., and M. Rowell-Rahier. 1989. Defensive glands and secretions as taxonomical tools in the Chrysomelidae. Entomography 6:423-432. Ritland, David B. 1991. Revising a classic butterfly mimicry scenario: Demonstration of Müllerian mimicry between Florida viceroys (Limenitis archippus floridensis) and queens (Danaus gilippus berenice). Evolution 45:918-934. Published in the February 2000 edition of Micscape Magazine.